The terminal has been recently upgraded and contains all the basic facilities: cafe, book- and souvenirshop, free WiFi and a Koru Lounge. Which airlines fly to Palmerston North Airport? Where is Palmerston North Airport located? Palmerston North Airport is located about 5 km northeast of the CBD of Palmerston North. How to get from the airport to Palmerston North city centre by public transport? At Palmerston North Airport all the major car rental agencies have an office, just after the baggage reclaim. Taxis are available as well; the taxi will use the meter but there is a $3 surcharge for the airport pick-up. A door-to-door shuttle service operated by SuperShuttle departs from the main taxi rank. 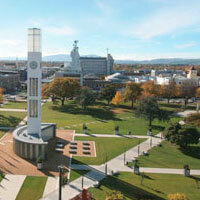 What are popular destinations from Palmerston North Airport? Palmerston North Airport is not a large airport so there are not many flights departing here. There are only a few destinations that you can reach from Palmerston North Airport, most of these are operated by Air New Zealand. Many people take a flight to Christchurch and transfer to another flight there.